Spelling a snippet of supercalifragilisticexpialidocious are (from left) Latham Nance (Bert), Reese Overstreet (Mary Poppins), Francie LeDuff (Mrs. Crawley), Lucy Allen (Jane Banks), and Willis Thigpen (Michael Banks). Two leading ladies are making appearances at Jackson Academy: Mary Poppins and Kerri Courtney Sanders. With the JA family and local theatre community supporting our students as they prepare to tell the Mary Poppins story, the cast members themselves have become a family. “Being in a show is like being in one big family, so I love being able to embrace that aspect and having so many amazingly talented kids join in on the fun,” Reese says. For Sanders, overseeing the production has already proven to be an extremely rewarding experience. “The most enjoyable part of this production so far has been working with the talents and creativity of the students,” she says. 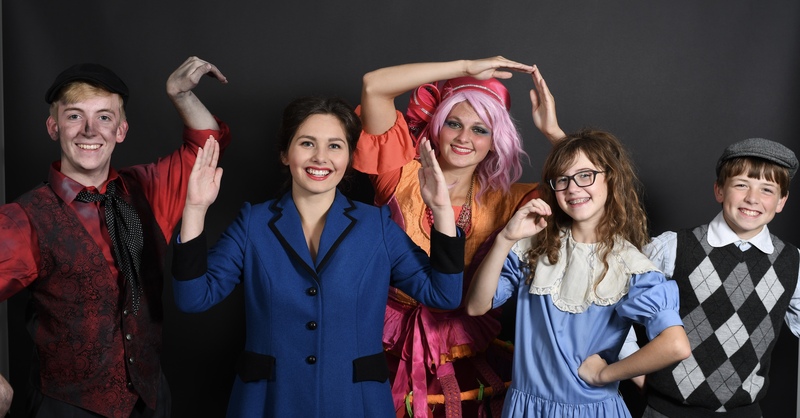 The classic story of familial love and conflict, adventure and imagination will come to life as a cast of 88 students presents the show in JA’s Performing Arts Center October 28-30 and November 4-5. After the October 29 performance, JA will host ‘A Jolly Holiday Tea Party’ where characters will spend time taking pictures and snacking on sugary snacks with guests. This family-friendly entertainment is available to the greater Jackson community, so bring your family, your friends, and your friends’ families. Eight hundred seats and five performances offer 4,000 opportunities to sweeten lives with a spoonful of sugar. To select seats and purchase tickets, visit https://www.ticketsource.us/jacksonacademy.